The drinks menu at Brooklyn Farmacy & Soda Fountain reads like a rainbow. The shop serves bright-red Cherry Lime Rickeys, yellowish pineapple sodas, and even Purple Cows—ice cream floats made with concord-grape syrup. All these saturated hues come from locally sourced, seasonal fruit, which soda jerks process into syrup without dyes or food coloring. Soon, the Farmacy’s full palette of recipes will also be available to home chefs: sibling co-owners Gia Giasullo and Peter Freeman’s new book, The Soda Fountain, comes out this May. The siblings weren’t born soda jerks. Giasullo spent most of her career as a graphic designer. 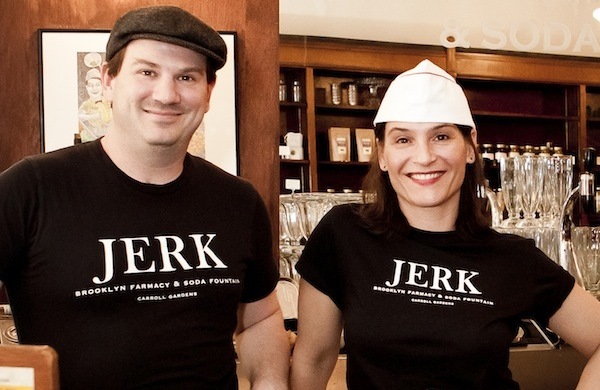 Freeman originally got the idea to open a soda fountain after he moved into an apartment above the Farmacy’s current space in Carroll Gardens. The old shop below had been boarded up for decades, but once he explored it, Freeman discovered much of the former pharmacy's vintage detail was preserved: patterned tile floors, a tin ceiling, even packages of old medicines unopened since the 1920s. 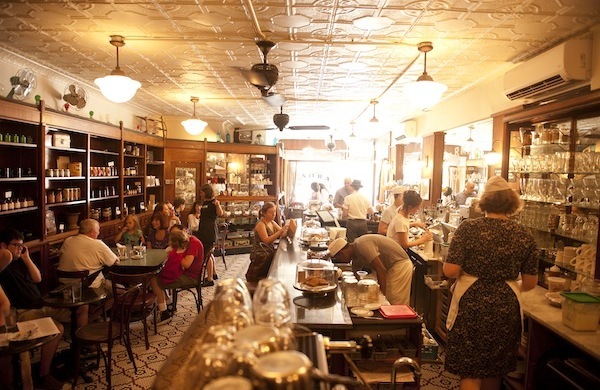 With a little help from TLC’s Construction Intervention, whose crew renovated the space and installed its 1920s soda fountain, the Farmacy was born. “We had no idea we were stepping into a renaissance of the soda fountain,” Giasullo said. No idea, that is, until the New York Times came knocking at their door. After the Farmacy was featured in a 2011 article (“For Soda, the Genie Is Out of the Bottle”), Giasullo said, the soda fanatics came out of the woodwork. “We were flooded with phone calls and people coming in and talking about their personal stories,” she said. “Stories about how their uncles had been pharmacists, or their parents met at a soda fountain, or their first job was at a soda fountain.” The rush of nostalgia came as a surprise to Giasullo and Freeman. “We realized we hadn’t opened up a new place, we’d opened up an old place,” she said. The duo began researching the history of the soda fountain, and they were fascinated by what they found. That’s why, when an agent approached them about making a cookbook, they insisted on a hybrid approach: the first 50 pages of The Soda Fountain is a written history of the subject, only after which do the recipes start. Of course, there are many cases where the recipes and the history overlap. One is the Brooklyn Egg Cream, which Giasullo calls “kind of magic.” Her father made the light-brown, frothy drinks for her and Freeman growing up. Though they contain no egg and no cream, and only “about as many calories as a slice of buttered toast,” they still always managed to feel like a treat. When you drink an egg cream, “you’re drinking history,” Giasullo said. No one is exactly sure who invented the drink, but it appeared in the last decade or so of the 19th century, and has been associated with the Farmacy’s home borough ever since. Since the shop opened in 2010, Freeman and Giasullo have made it their mission to “bring the Brooklyn egg cream back to Brooklyn,” as she put it. At the refurbished 1920s fountain, soda jerks mix the drinks for out-of-town tour groups as well as for locals like Bobby Egg Cream, a Farmacy regular. In The Soda Fountain, Bobby’s instructions for egg-cream-making appear in untranslated “Brooklynese.” A sample: “Put ya spoon in the glass and stir it, like this. But not too hard! You don’t want to beat the crap out of the seltzer.” Giasullo seconds Bobby’s emphasis on the seltzer. 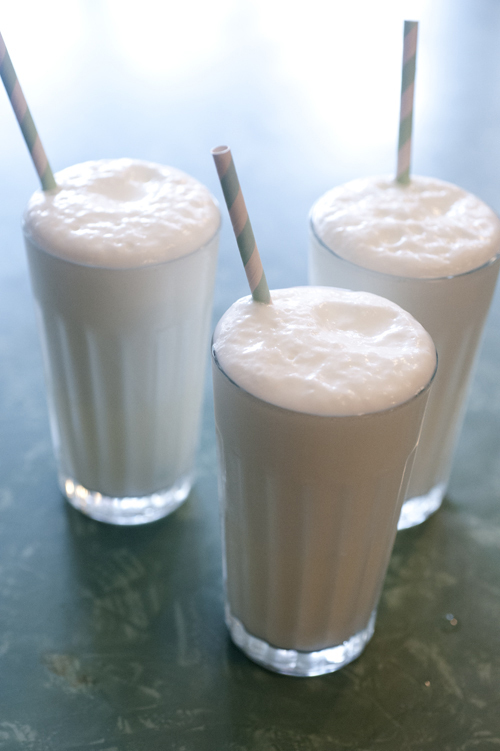 It’s vital to a successful egg cream—and to any soda-fountain drink, really, she said. Unless they have a Sodastream in their kitchen, home cooks may have a difficult time replicating a perfect cup. Giasullo recommends Vintage Seltzer as a bottled brand that packs the requisite pop. To maximize authenticity, the Farmacy’s egg cream also uses Fox’s U-Bet chocolate syrup, which Giasullo said “evolved alongside” the drink itself. Non-Brooklynites can buy bottles online here. Brooklyn Egg Cream (Adapted from The Soda Fountain) What you need: * ¼ cup + 2 tbsp cold whole milk * ¾ cup plain cold seltzer * 3 tbsp Fox’s U-Bet chocolate syrup Pour the milk into an egg-cream glass and add seltzer until froth comes up to the top of the glass. Pour the syrup into the center of the glass and then gently push the back of a spoon into the center of the drink. Rock the spoon back and forth, keeping most of the action at the bottom of the glass, to incorporate the syrup without wrecking the froth. Serve immediately. Reprinted with permission from The Soda Fountain by Gia Giasullo and Peter Freeman, copyright (c) 2014. Published by Ten Speed Press, a division of Random House, Inc. Photography (c) 2014 by Michael Harlan Turkell. Nathalie is a writer and editor on the Guide's food team. Originally from Virginia, she now lives in Chicago, where she regularly indulges her love of tortas, bibimbap, and Cheez-Its. Follow her on Twitter @maviswillsaveus.